The collection shows the work done by the different cartographic schools and gathers a fair set of documents from the 17th, 18th and 19th centuries which are connected to both chorographic cartography and navigation. 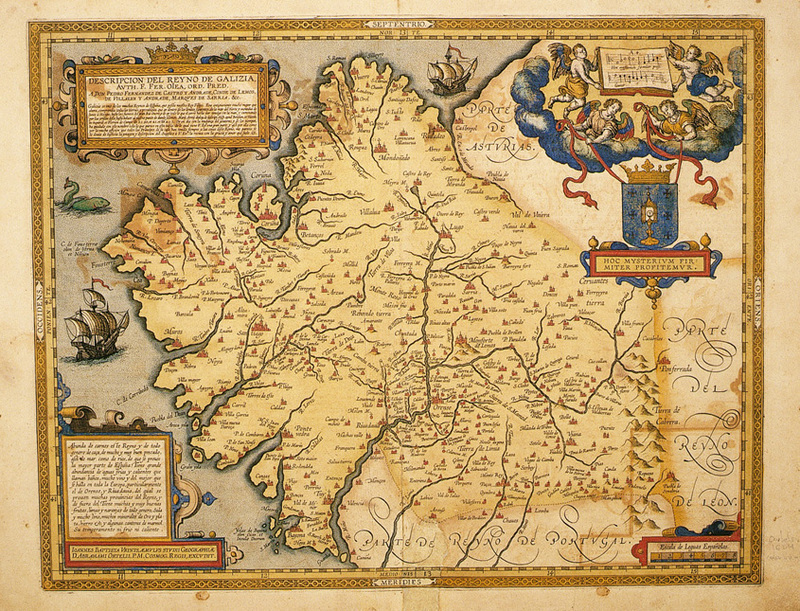 From the moment Benedetto Bordone publishes a map in Isolario (Venice, 1528), the catalogue of the map collection gathers the work of great editors and cartographers like Metellus, Ortelius, Mercator-Hondius, Merula-Bertius, Tassin, Blaeu, Janssonius, Briet, Montecalerio, Sanson, De Wit, Mortier, Iaillot, Cantelli-De Rossi, Danckerts, Valk-Schenk, Visscher, Müller, De Fer, Robyn, Browne, Coronelli, Van der Aa, Allard, Bodenehr, Reinier-Ottens, Vaugondy, Tomás López, Nolin, Sutil, Cornide, López, Amoedo –the last four of them appear in España Sagrada by Henrique Flórez–, Philippe, Zatta, Bonne, Tardieu, Von Reilly, Carli, Cassini, Zappino or Gussefeld, amongst others. 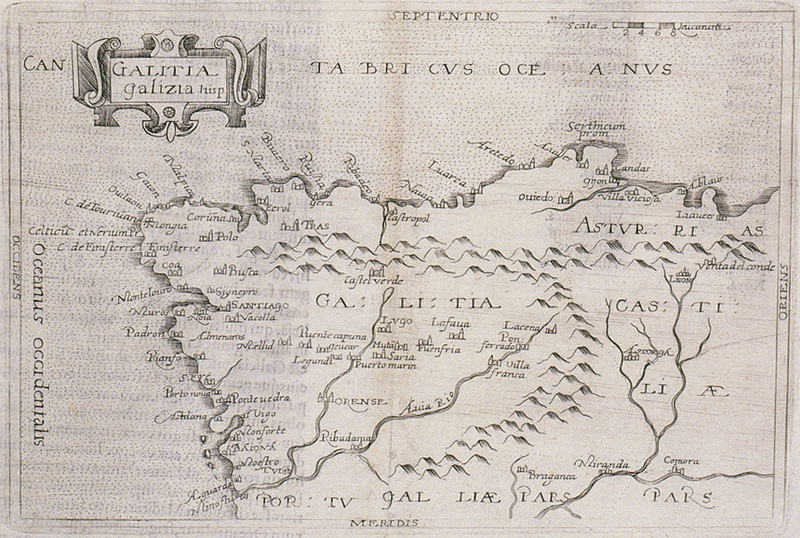 From the 19th century, we can highlight the work done by Domingo Fontán, whose “Carta Geométrica…” -printed at Lemercier’s print shop (Paris, 1845), is the reference for Galician 19th century cartography. However, we should not forget other figures, like Borghi, Lapie, Vandermaelen, Dauty and Malo, Coello or Boronat. This map collection is made up of about a hundred and ninety documents and it also brings together a considerable number of city maps and monuments. The marine cartography of the collection includes, in the first place, the pioneer work by Waghenaer, which is an atlas that saw the light of day in Leiden and Amberes in 1583 in five successive editions until 1590. The first of them -Sphiegel der Zeevaert- is in Dutch and contains twenty three charts from Cadiz to Scandinavia. Moreover, the compilation has eleven charts relating to the Iberian Peninsula, three of which are concerned with the Galician coast. Waghenaer’s work had such an impact that from that moment on many navigation atlases were published in Europe. Highly reputed editors like Blaeu, Colom, Merian, Dudley-Lucini, Goos, Ianssonium, Doncker, Theunisz, Seller, Van Keulen, Mortier, De Fer, De Wit-Renard, Bellin, Mount and Page, Kitchin or Dezauche-Magin produced their own “zeespiegel”. In Spain, we can highlight the figure of Vicente Tofiño de San Miguel, who was born in Cadiz in 1732. He was director of the Academia de Guardiamarinas (guardiamarinas are sea cadets in their final two years of training) and also a highly reputed astronomer admired by European scientists. 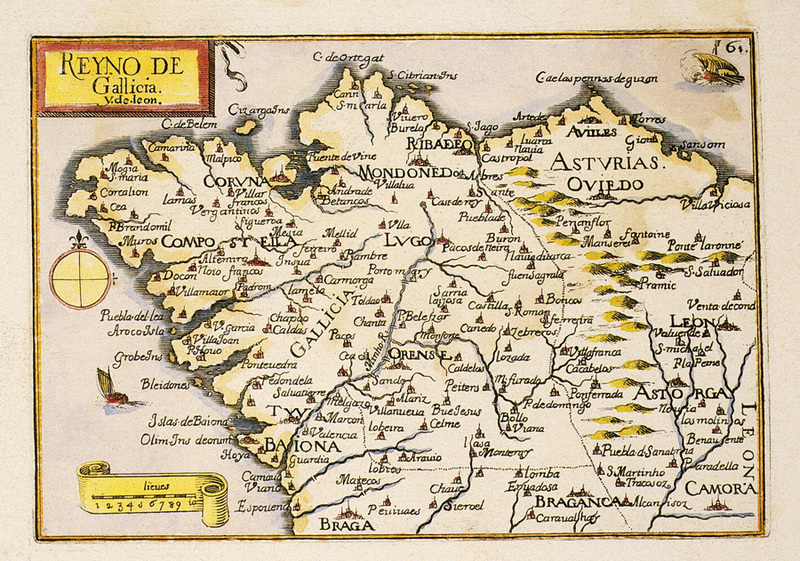 His Atlas Marítimo de España can be considered as the most important cartographic work developed in Spain and the starting point for modern cartography. Many of the charts published by Le Service des Vaisseaux de la République Française and by Faden in London are based on the surveys carried out by Tofiño. In the 19th century, we not only find the work by outstanding private editors like Whittle, Gustav Klint, Luffman, Norie, Gold, Fernández Flórez, Doral, Lowry, Robiquet or Losada but also the creation of official organizations in all the countries which give rise to a more prominent state role in the cartographic production (e.g. Depósito Hidrográfico de la Marina). 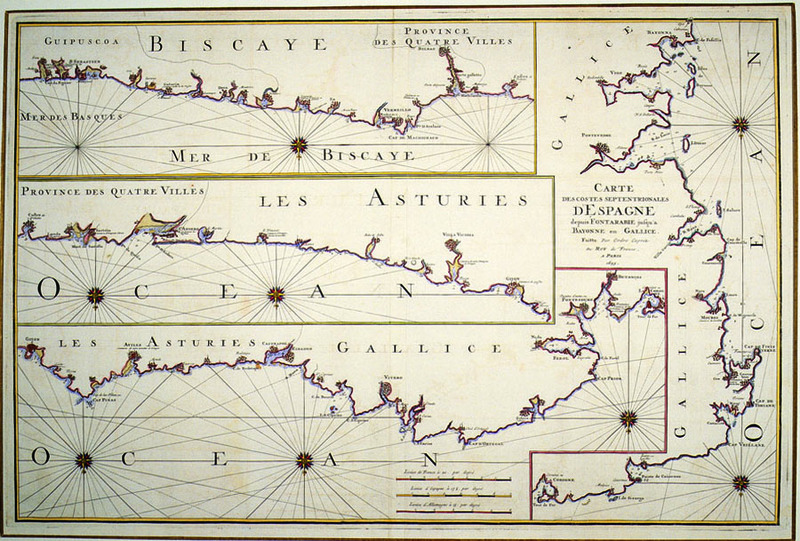 serves to make the collection have an approximate number of two hundred thirty maps where a part of the North Atlantic area is represented (from Ouessant to Cadiz). 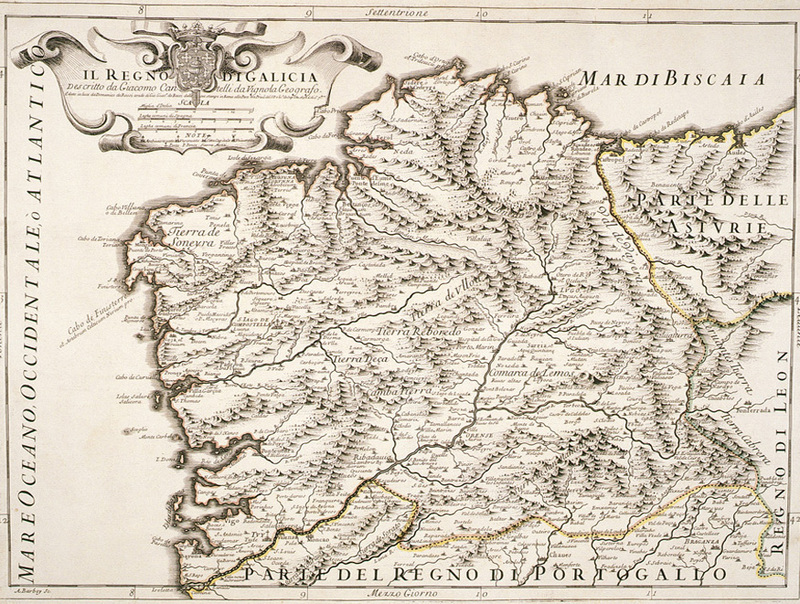 Therefore, apart form Galicia, the Portuguese and Cantabrian coasts are also shown. This set of charts is complemented by a series of rutters from the end of the 17th century until 1900. These rutters (derrotero, in Spanish; routier in French; roteiro, in Portuguese) were written for navigators and were the main guide for pilots who had to steer ships. Sailors from northern Europe depended on them until the 15th century. 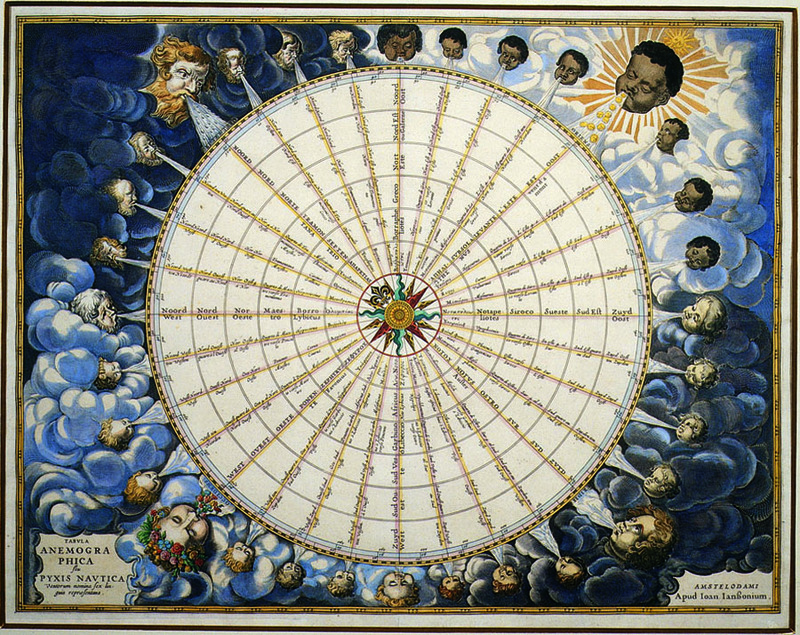 From the 16th century on, they widen their information in a graphic and systematic way, including views of the coast, just as it was seen from the sea. Sometimes, they also included small maps of the area covered by them to facilitate navigation. 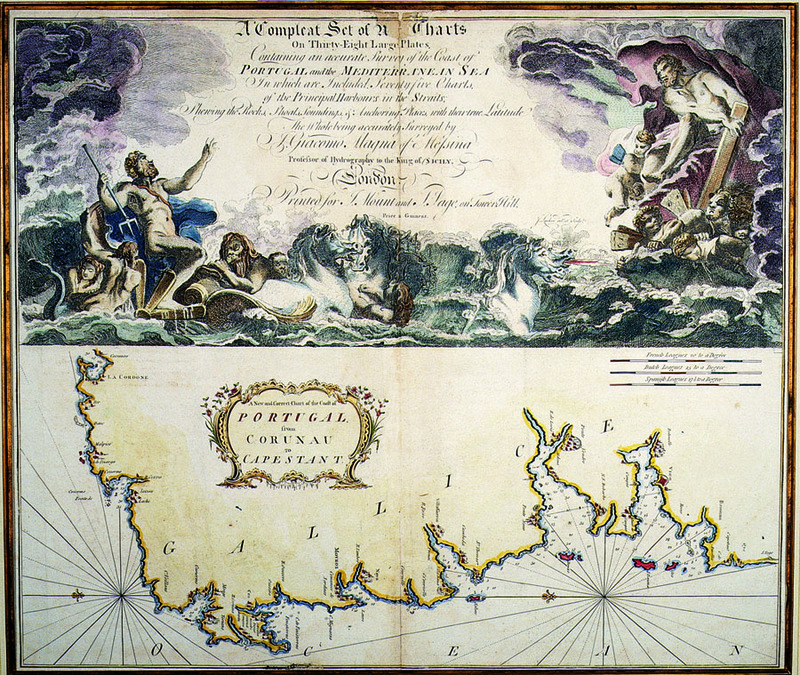 Le petit flambeau de la mer, by René Bougard (Le Havre, 1694) is a navigation book which contains sixty seven charts. It was widely used in the Navigation Schools from 1684 to 1817. 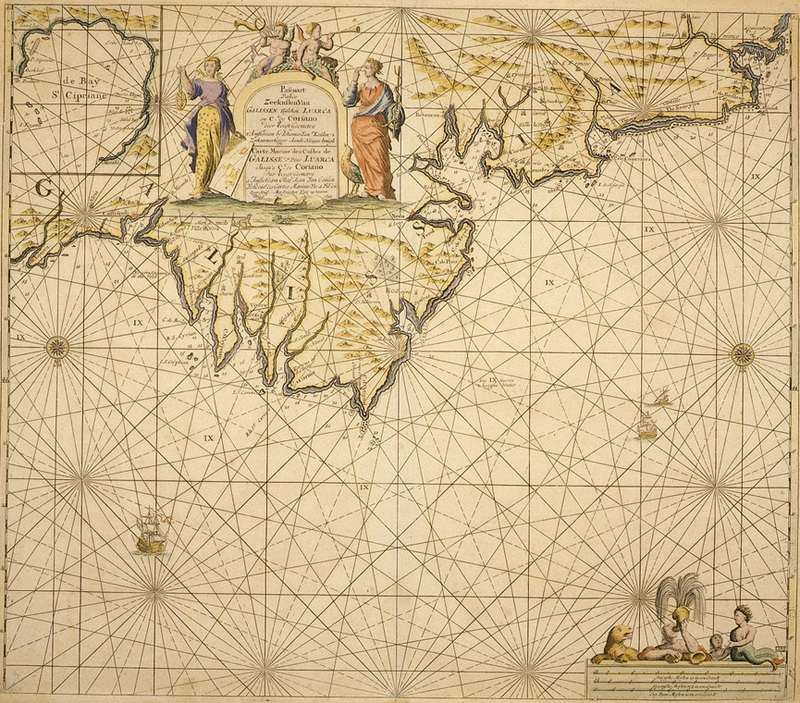 This work gets its name from the title of the nautical atlas published by Blaeu and Ianssonius. Arte de navegar… e Roteiro (Lisboa, 1712), a later work by Manoel Pimentel is divided into two parts. While the first one is more theoretical, the second one is larger and devoted to a series of routes for different parts of the world. 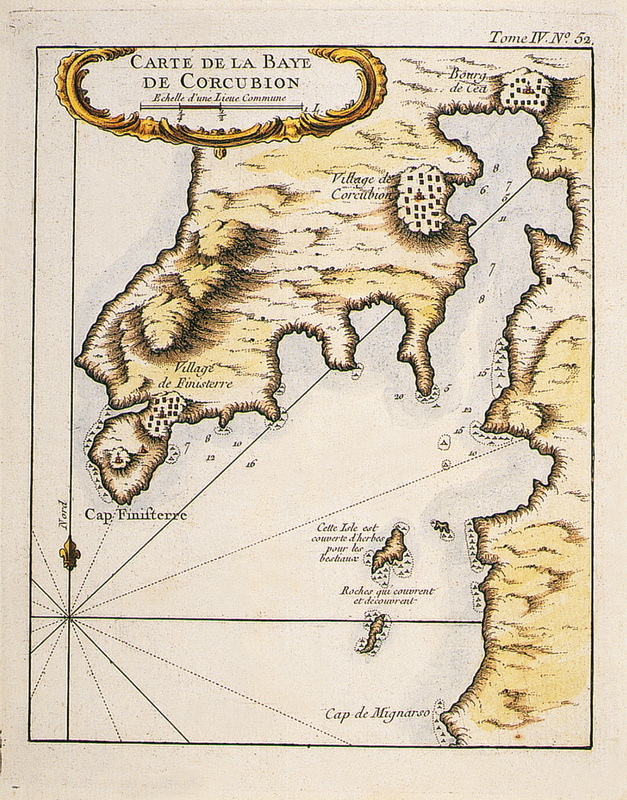 In this collection we can also find Derrotero de las costas de España en el Océano Atlántico y de las islas Azores o Terceras, para inteligencia y uso de las cartas esféricas (Madrid, 1789), by Vicente Tofiño cited above. In the 19th century, the number of publications of this type of work increases rapidly: Sailing directions for the coasts of Spain and Portugal from Cape Ortegal to Gibraltar (Londres, 1838) and Sailing directions for the bay of Biscay including the coasts of France & Spain from Ushant to Cape Finisterre (Londres, 1847), by the famous British hydrographer J. W. Norie; Derrotero de las costas de España y de Portugal desde el cabo Trafalgar hasta el puerto de la Coruña (1867), which was written by honorary frigate captain Pedro Riudavets y Tudury; or Sailing Directions for the coasts of Spain & Portugal from Cape Ortegal to the Strait of Gibraltar (Londres, 1868), published by James Imray, are some of the examples included in the collection. 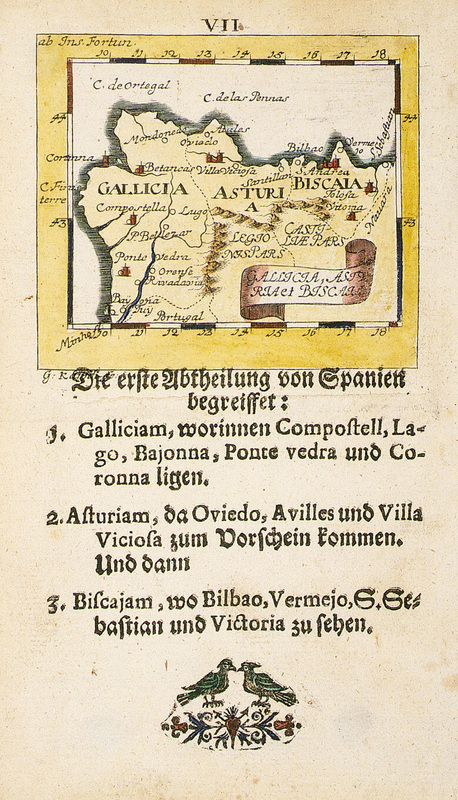 From April 3rd to April 30th 2000, the Colexio de Fonseca in Santiago de Compostela showed an exhibition with part of this cartography collection. In July, 2000 a similar exhibition took place in Vigo. Thanks to that, a catalogue with three hundred and twenty one illustrations was published. The Ministry for Education and Culture awarded it in 2001 with the first prize as the best edition for Book-lovers. In 2001, another exhibition takes place in Ourense; one year later, it takes place in A Coruña, at the Exhibition Centre Kiosco Alfonso.